NWH is a leading global healthcare REIT operating in five countries. BNN Interview with Paul Dalla Lana discussing the international portfolio. 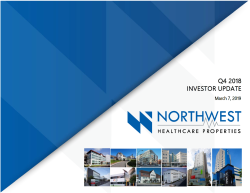 NorthWest Healthcare Properties is focused on providing its unit holders with access to high quality healthcare real estate investments in 6 countries. NorthWest Healthcare Properties REIT (TSX:NWH.UN) is a publicly traded REIT which completed its Initial Public Offering on March 25, 2010.